Fujitsu Siemens' Esprimo range is designed for the business user, with products offering mobility, strength and usability. With an affordable price tag and lack of features, the Esprimo Mobile V5505 (£453 inc. VAT) ﬁts in at the low-end of the range and is one of the cheapest machines among its rivals. It features a 15.4-inch display, which proved disappointing. Colours and images were muted, although the TFT panel's matt ﬁnish is an improvement when out and about, hiding dust and ﬁngerprints. 3D performance is limited due to the use of an integrated graphics card, but battery life beneﬁts as a result. You'll be able to get over three hours of use from this machine between charges, making it a good tool for the commuter. Its size means we wouldn't want to carry it around every day, but the 2.7kg weight was ﬁne for short journeys. The keyboard sits in the very centre of the chassis, with wide and ﬁrmly-attached keys. They're not the most responsive, needing to be struck ﬁrmly in order to register. Build quality is good, and the rather conservative-looking chassis is one of the stronger designs we've seen. The plastics used are thick and resilient, and the avoidance of a glossy ﬁnish means you'll be able to use it daily without fear of scuffs or scratches. The Esprimo is lacking when it comes to performance, as it uses a low-end Intel Core 2 Duo T5250 processor. It runs at 1.5GHz and, along with just 1024MB of memory, limits the V5505 to basic ofﬁce tasks. This was reﬂected in our benchmarking tests, where it posted some poor results. The 80GB hard drive offers restricted storage space, and this machine betrays its budget price when it comes to features. A webcam is omitted – so you won't be able to participate in video-conferencing, and those wanting to connect external displays will have to do so using the analogue-only VGA-out or S-Video ports. Things are better when it comes to networking, where an 802.11n Wi-Fi chip provides the fastest connections to wireless networks, and Gigabit Ethernet lets you connect to your ofﬁce network at high speeds. Backup comes in the form of a dual-format DVD rewriter, and Nero software is included for burning your ﬁles to blank DVDs and CDs. 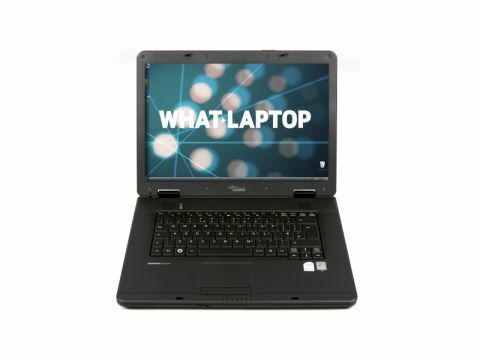 The Fujitsu Siemens Esprimo Mobile V5505 isn't an all-round disappointing laptop and is still worth a look for corporate users on a tight of budget. However, it simply struggles to compete in this company, where a lack of performance and features let it down.